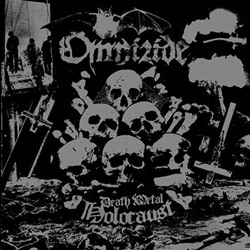 Carnal Records is set to release “Death Metal Holocaust” from Swedish Black/Death Unit OMNIZIDE on January 31. Featuring lead vocals from CRAFT throat Mikael Nox and music written by AE from AVSKY, the album follows the highly celebrated EP “Pleasure From Death” (the tracks from which are included as bonus material), the decibel assault reaches a new level of pain to ensure maximum aural decimation. “Death Metal Holocaust” was mastered by Joakim from CRAFT. Prepare for the unleashing of the demon spawn. The story of OMNIZIDE goes back to 1995 when Nox and Anders formed the Black Metal band BELZEN together. A few years later BELZEN split up. Nox joined CRAFT and Anders started the band AVSKY. When Nox did some guest vocals on AVSKY’s album “Scorn”, Anders and Nox decided to start BELZEN again. They changed the name to OMNIZIDE and recruited drummer Gaddur from the band KAFZIEL. In 2011 the “Pleasure From Death” EP was released. Later, guitarist Jesper joined the band and “Death Metal Holocaust” was recorded. After the recording was complete, bass player B-Force (DARK FUNERAL) joined the fold.